Whenever I go camping or hiking and there will usually be a point where I’m by myself. This is also the poing where I kind of freak out at how quiet it is. I live near a major highway and train tracks. It’s never very quiet inside my house let alone outside. This actually required a second read before the joke sunk in. Well played, Sir! 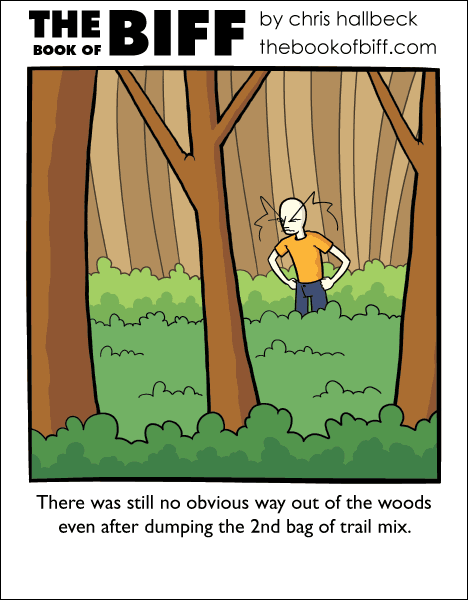 Clearly, he’s using the wrong brand of trail mix. I had to look up what trail mix is, because we don’t have that stuff in Sweden… Or at least not what I know of. You can buy nuts, almonds and chocolate-y snacks by weight (in the same way as candy in Sweden as well), but you’ll have to mix it yourself. Besides, the nuts you buy by weight are soo much tastier than the ones in plastic bags. I have seen mixed nuts sold in plastic bags at my local Ica when I think of it, but it was several years ago (and I don’t think they sell this anymore). There weren’t any chocolate or candy in the bag though, just some mix of roasted nuts, raisins and peanuts with a taste of honey… I didn’t like that at all. I don’t eat raisins, and the honey peanuts were *way* too sweet and sugar-y. Maybe he didn’t mix it right. It’s them stinking M&M’s I’m telling ya.